Have you ever been to a restaurant at 5pm (for dinner) and wait for it to open? This must be the only restaurant I have done something like that! I have heard so much about this plac, the incredible crowds it draws and the ridiculous queues. So, one fine Saturday evening we were there at 5pm. They were not opened yet and we stood in front of the restaurant a good 45 minutes waiting for it to open! The must-order item here is its famous Steamed Lala in Supeior Stock. We ordered 2 big portions (RM22) for our group of 7 people. 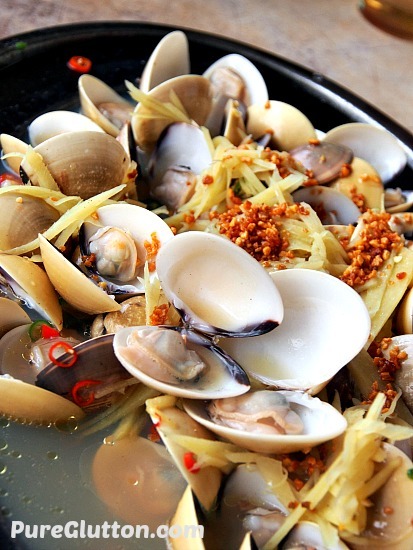 The lala – clams were fresh and juicy but what I liked most was that they were clean with none of the muddy bits commonly found in lalas. There were generous sprinklings of ginger strips and chopped chilli padi and these added enough heat to the Chinese wine-enhanced delicious soup bathing the lalas. Needless to say, we slurped up every single drop of the broth with great relish. 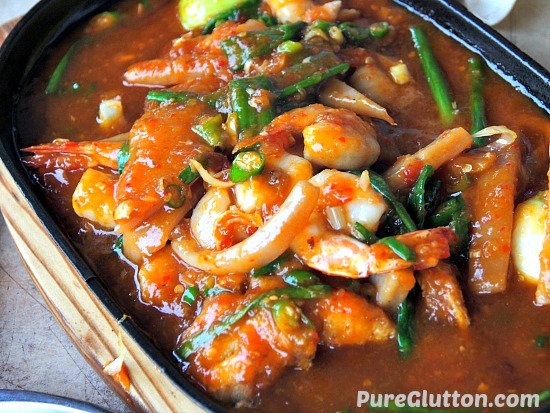 Another recommended dish (which we saw on almost every other table) was the Seafood Hotplate (RM25) which had prawns, fish fillet and cuttlefish simmered in a thick spicy tangy sauce, the aroma of which wafted to our table even before the dish was placed on it. 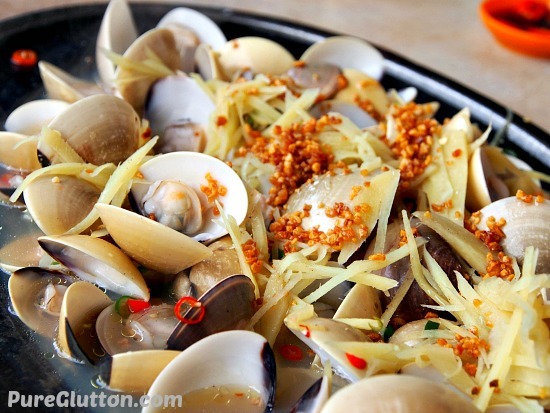 The downside of this dish is that you need to have lots of rice to go with it! 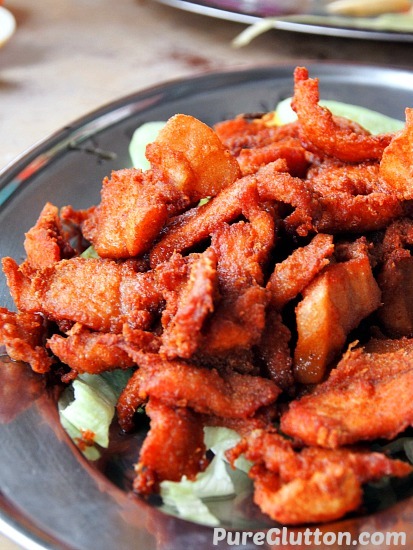 I found the Deep-fried Pork Belly (RM20) a bit dry and not fatty enough. There was more lean meat than fatty layers, but the flavours were robust with fermented red bean curd being used in the marinade. Their Mantis Prawns with Nestum (RM15) were incredibly addictive. 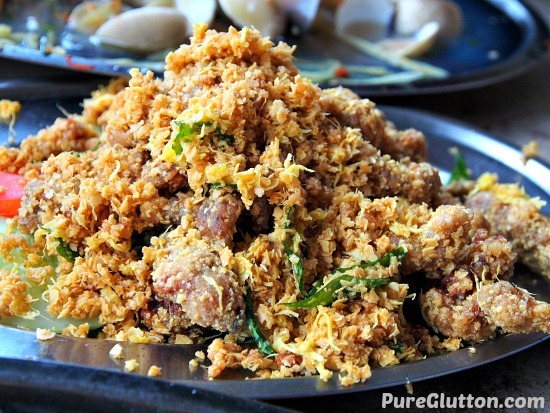 Deep-fried batter-coated chunks of mantis prawns were tossed with the fragrant cereal and curry leaves – a combination that’s just fail-proof. Every other table had Hokkien Mee (RM10) and their popular Tapioca Flour Noodles (RM12), so we followed this trend as well. 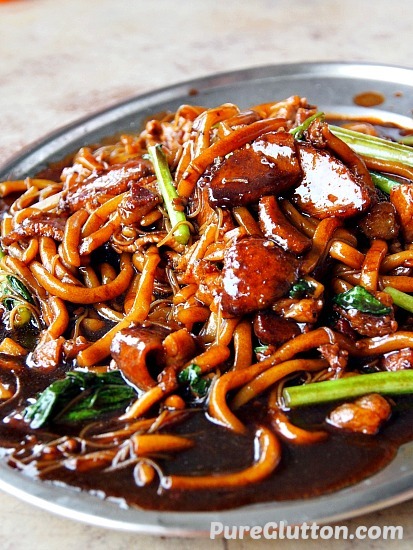 When the Hokkien Mee was served, it had a lot of thick gravy but as we ate, the noodles quickly absorbed the gravy rendering the noodles slippery and glistening with intense flavours. Of course the generous sprinkling of crispy lard boosted the aroma and taste several notches up. 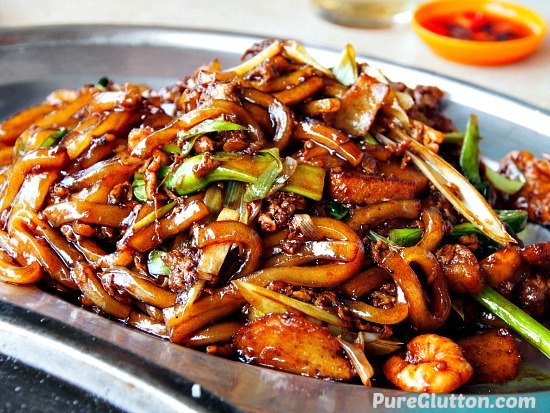 Their Tapioca Flour Noodles are translucent flat noodles which were more chewy than the Hokkien Mee. Lots of Chinese leeks were used in this dish giving it a nice bite and a sweet twist. 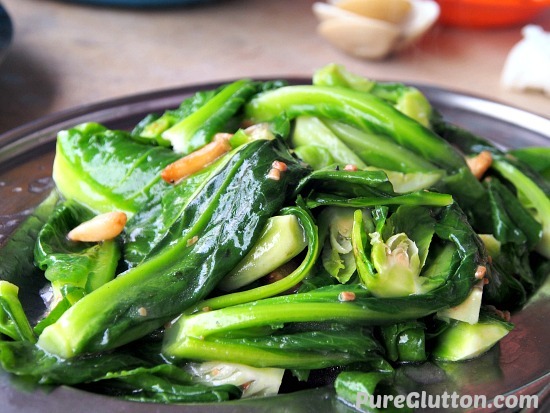 Oh yes, there were lard croutons – “chee yau cha” in this dish too! Service is pretty quick if you are there early, meaning, be there before they open! Of course once the crowds pack in, you’ll have to wait up till 45minutes (minimum) for your food to arrive. 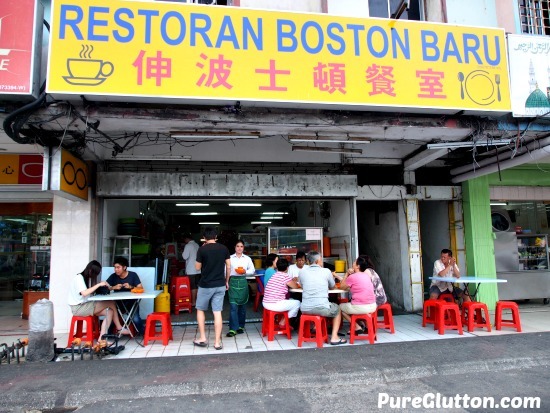 For a simple satisfying “tai chow” kind of meal, Restoran Boston Baru delivers a good package at reasonable prices. We had a plate of Stir-fried Baby Kailan with Garlic (RM10) and this meal for 7 people came up to RM143, including drinks. Be sure to be there very early (before 6.00pm) or go a bit later, after the peak dinner hour. heard so much about this place and the legendary wait time, must try one of these days! I’m surprised you haven’t tried this yet?! Go, faster go, LOL! Oh yes, I saw many other people ordering that! Must be good! It opens at 7pm! I was there on Friday and they do NOT open at 6pm. Please be aware lest you wait an hour plus. I ended up going to have Bak Kut Teh. Oh dear, really? Guess they are not in a hurry to open for business early! Hi. Do you know if they open everyday? I have tried to call the number but no one pick up. As far as I know, yes they are open every day.